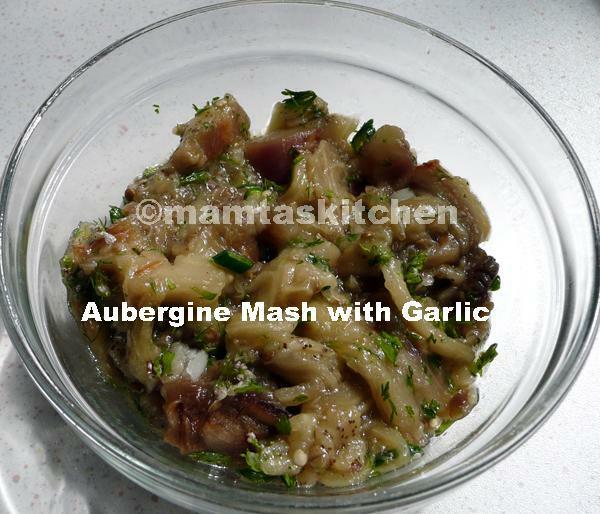 Make 4 random slits in each aubergine and insert cloves of garlic. Slits also stop aubergines from bursting during oven cooking! Grease with oil and roast on a roasting plate on gas fire or in the centre of a very hot oven, until very soft to touch. Take out, cool (you can do this under a cold tap if you are in a hurry). Peel aubergines and mash pulp using your hand. Do not puree in a blender. That makes it too smooth. Add all ingredients except oil and mix. Place in the serving dish and spoon over 1 tsp. oil. It can be served as a starter, with small pieces of Nan or Pitta bread.